Looks ugly, sitting in some cash, willing to buy in one more time, because I think GDX will be Dover Sole early summer, and higher by years end. Another 10-15% drop would be nice to buy. 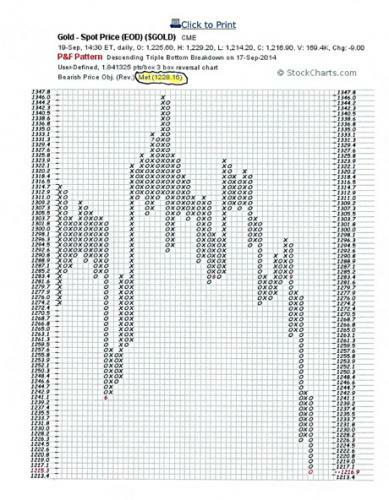 Maybe by end of May, or just buy the S&P if ZIRP is going to last forever. 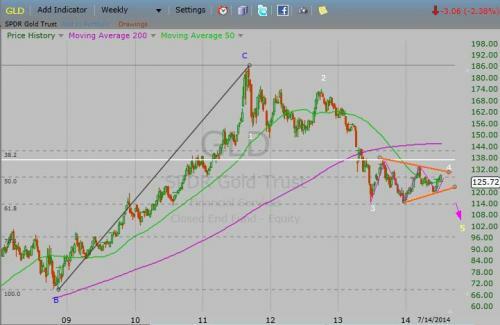 Gold coiling; 20,50,200 moving averages all flat lining. 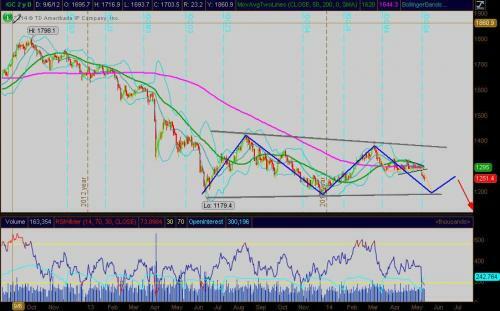 Triangles on price and RSI. 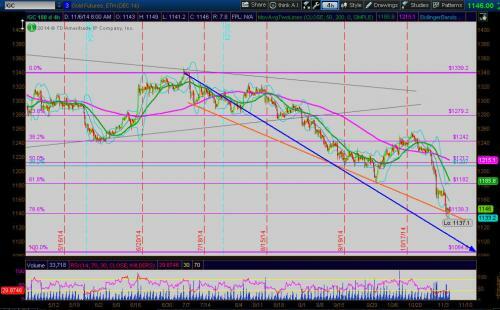 Whichever way it breaks should make a good trade set up. Gold picked the low road, gapped out of the coil so it didn't offer low risk entry, if it pulls back I'd think about a short with DGZ but I'm heading north soon. Way back I offered two scenarios for gold longer term (see prior posts), the first one bullish and actually successfully traded that last rally most of the way, then right at critical resistance it went sour and so changed the count bearish and for quite some time. 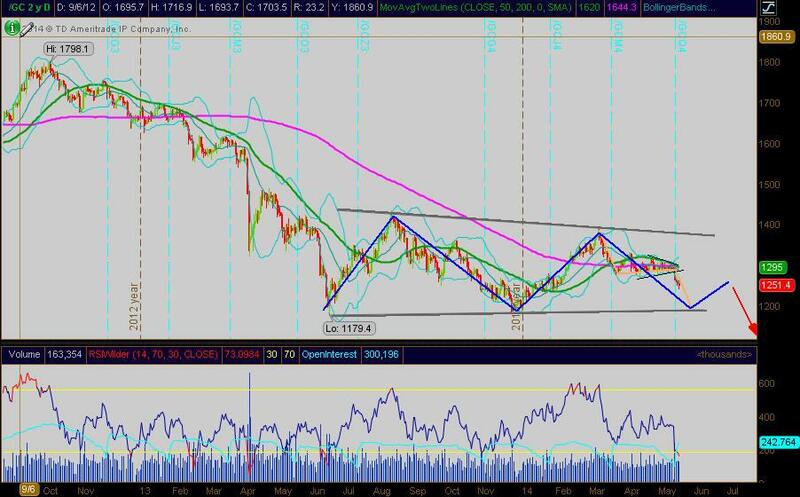 The bearish count is a large degree wave 4 contracting triangle., This leg down is wave D, it appears to be a symmetric A-B-C move down to the projected lower trendline of the large degree triangle. There we should have the final 5th wave (E-wave), frequently Wave E's don't cover much in price but form a tight consolidation then break out of triangle, they are the most unpredictable wave in triangles. But if and when this happens projects us down right around 1000. AEM appears to gap up through previous gap down. No doubt, it's a significant improvement in price and signal for the sector. There is a popular song out there that says, "Wake me up when it's over." Gold down $33 but the equities are holding up pretty well so I'm buying the dip here with good quality miners...Rio Alto and Virginia Mines. 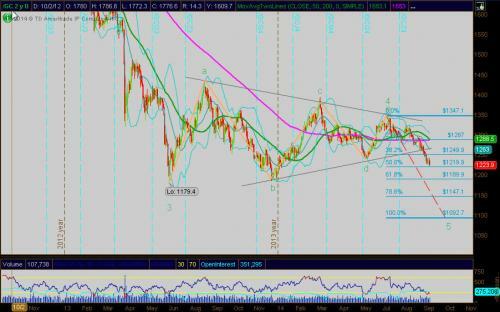 Gold still forming a nice large degree 4th wave triangle that should resolve in final wave 5 down. We are in final E wave of triangle and I expect to see volatility contract to lowest level since entering the triangle as this wave comes to its conclusion. 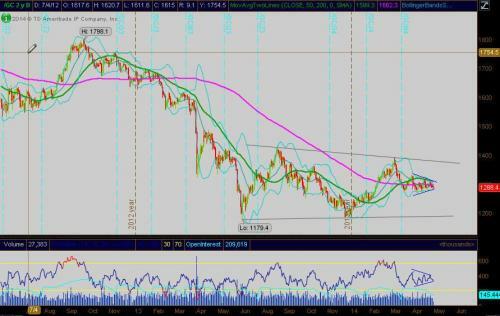 First indication I may be wrong is if it surges beyond the upper trendline of the triangle. So I am still standing on the sidelines here. I'm viewing it as the 5 down was already truncated. We should know within a day or two either way so I'll be nimble. 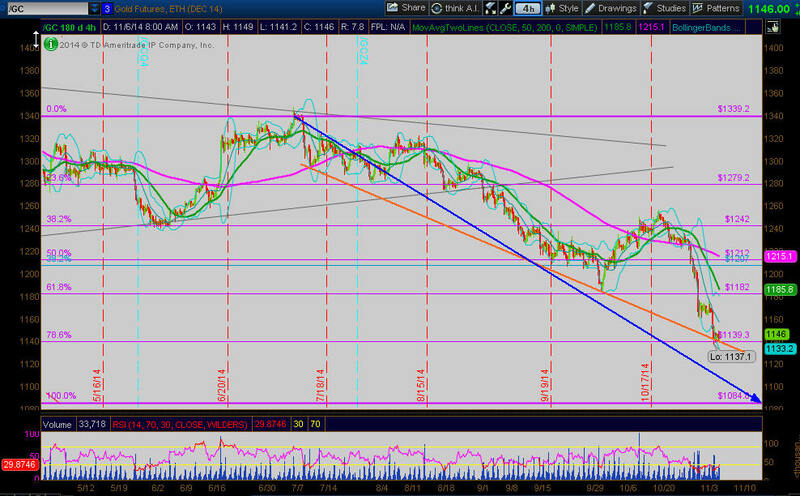 I'd be more comfortable if the $usd didn't look so strong and the COT reports so bearish. My take on gold for what it is worth. 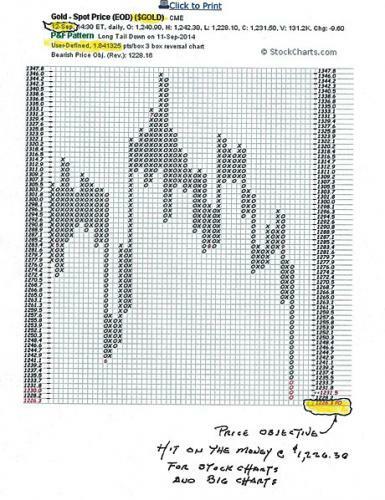 Printed this point and figure chart last Friday 12th of September 2014. My work shows that the low in gold is in at $1,226.30. Hope I am right. We are only at .50 of triangles base, the Minimal thrust extension of Wave a and pretty rare to see. 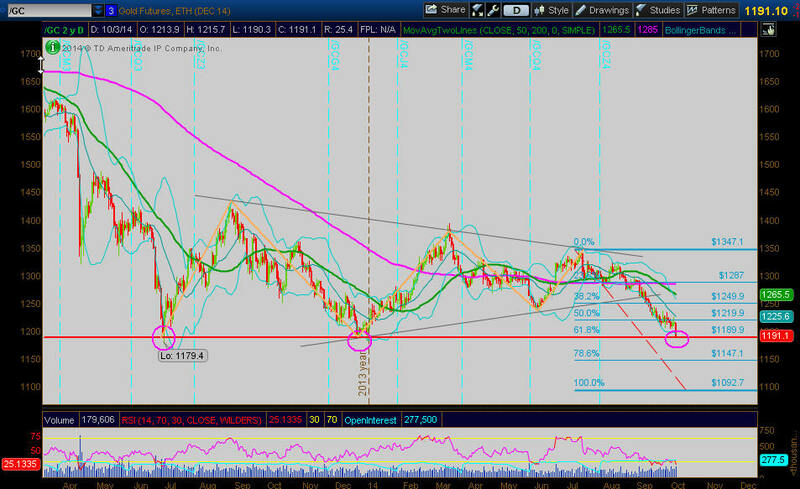 More likely we go to at least 1.0 @ 1100. 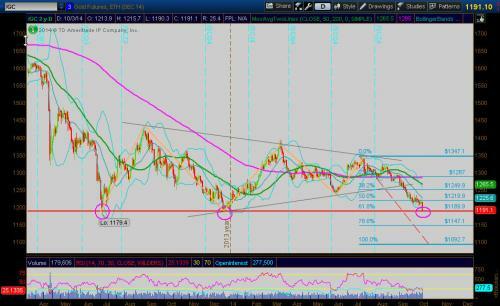 I don't short gold but that would still be preferable position here. But I am long the buck. Even the war drums aren't turning gold around, not a good sign. all the way so far! I am going to try and make my last attempt to call this bottom. It is my hope that we can hold the $1,179.40 and the $1,181.40 swing lows if so this is what I came up with for the target price. Using the parabolic SAR cross overs that I have shown from Stock Charts they are $1,392.60 and $1, 337.73 now subtract the two that equals $54.87 now mutiply by 3.5 which I call circles that equals $192.05 now take the swing high of $1,392.60 minus $192.05 that equals the target price of $1,200.55. Now notice my last post p&f chart showed a bearish price projection of $1,228.16 then it broke that level and now the latest chart shows that the price projection was met at $1,228.16 so let's take that met price and subtract 1/2 of the $54.87 SAR circle which is $27.44 This comes out to be $1,200.72 target price. If I am wrong again I am going to crawl back under my rock for an undisclosed extended period of time. GOLD now at the 61.8 FIB of the Wave 5 projected move from base of the Wave 4 triangle. 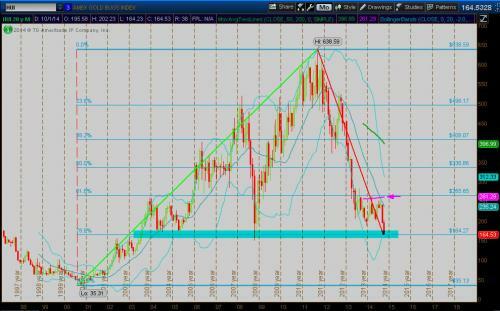 Even more significant now is it is at a "third watch" test of support. Statistically third watch tests of support or resistance have the highest probability of breaking through and often surge once broken! 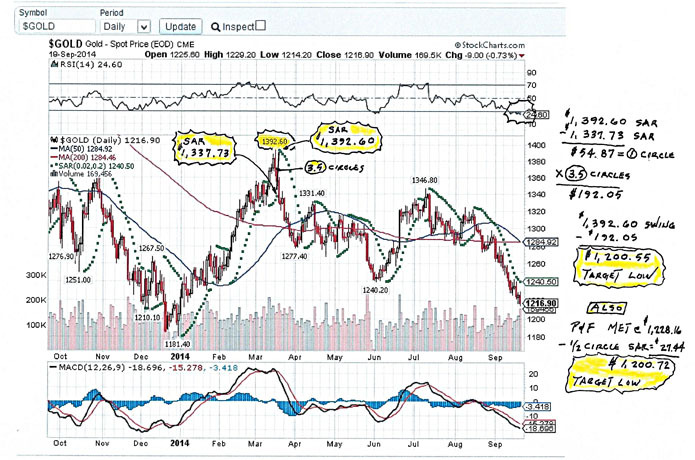 Last of the gold bugs being swatted after flying high during this gold bull market. Wondering if I will get to see another in my lifetime. Last hold out at 78.6 FIB and 2-4 trendline support then down to 1085 for 1:1 extension of the large degree wave 4 triangles base. One thing about gold is has been a good market to trade using EW and Fractal systems. Just wish it were still a bull rather than bear market but once this wave 5 finishes up and it may soon we could finally get an opportunity for a more sustained move back up that's tradable.